If you are interested in learning more about the Edgewater Historical Society’s position on the redevelopment plans for Trumbull and contributing your feedback to Alderman O’Connor, have a look at what they sent in this morning (and the link to Alderman O’Connor’s questionnaire) below. 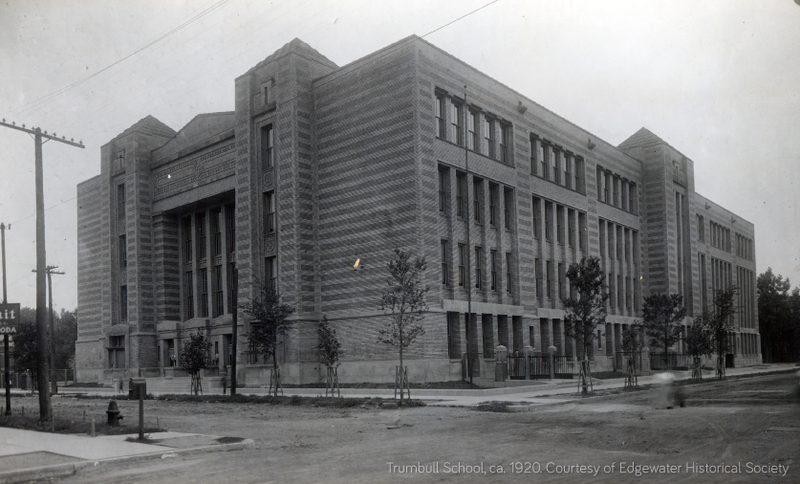 “We are pleased to report that it appears as if the Trumbull School Building will be saved; but we don’t know if it will be landmarked or whether it will be repurposed as a school or as housing; or whether the wonderful auditorium will be saved. Here is a link to Alderman O’Connor’s questionnaire (due by December 5) seeking community input about the future use of Trumbull resulting from presentations made recently. Anyone can respond to the questionnaire, you will have to indicate whether or not you attended the meeting and list an address. The Alderman’s office wishes to keep track of those who liveclosest to the school. It seems to be a thorough and fair questionnaire. The questionnaire acknowledges that the building will be saved , and asks whether the respondent thinks it should also be landmarked on a scale of 1 to 5. It asks a number of other questions about the presentations that were made. If you didn’t go to the meeting, there are general questions about types of uses for the building as well. The Edgewater Historical Society’s position is to landmark the building and the auditorium. Several of the presentations made recently would keep the auditorium as a theater or as a public space. Only one school (Waldorf) presented; four proposals would convert the school into housing units, and one late (and sketchy) proposal suggested using the school as a film studio. One of the housing proposals would convert the first floor into a health/activityfacility, using the auditorium as a rock climbing setting. Please take a few minutes to complete the questionnaire and feel free to send it to others who have an interest in landmarking Trumbull. Previous PostBackyard Front Yard: Edgewater Glen Coyote Week Continues…Next PostHuh…Winter Streetfest? Bust out the Mittens & Mulled Wine!